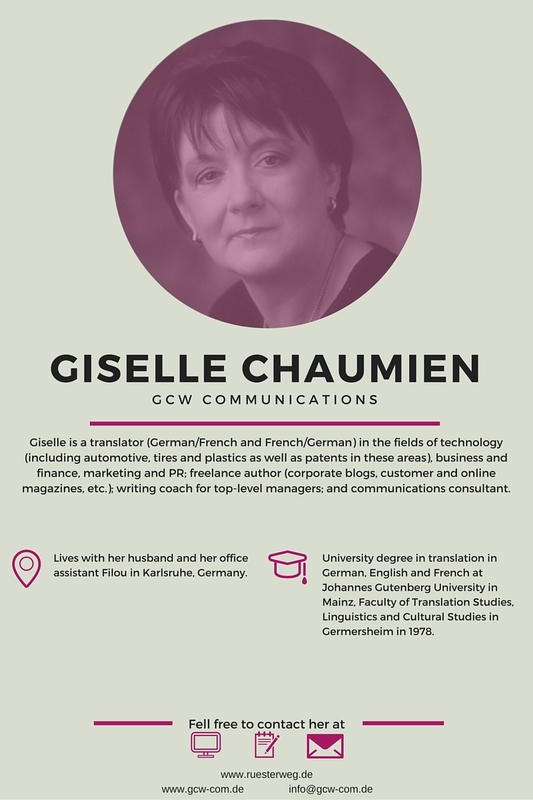 Please welcome this month’s Greatest Woman in Translation, Giselle Chaumien, nominated by Nicole Adams. 1. Your mother is German and your father is French. Was your upbringing bilingual at home? If so, how was the experience? In my opinion, there’s something that’s much more important than a bilingual upbringing: our parents taught us that random acts of kindness enrich your life. That’s something that’s much more widespread in the United States and the United Kingdom than in Germany. This principle has come to play an increasingly important role in my life – perhaps it has to do with my age. The life that we share with everyone else is like a big pot of soup, with chunks of meat, slivers of vegetables and noodles floating in it. You pick something out of the soup that you like or need, and that makes you happy. And you should put something else back into it, so that others find something good as well. Thus, in my own small way, I try to give back some of what helped me in earlier years and from which I still benefit today. This approach to life is the real legacy of my parents. 2. You studied in Germersheim, at Johannes Gutenberg-Universität Mainz, Faculty of Translation Studies, Linguistics and Cultural Studies (one of the best universities for translators and interpreters in Germany), where you later became a lecturer. What was it like to switch roles and become a lecturer where you were once a student? I had already held a teaching position while I was studying there, as one of the instructors who headed the tutorial for German/French legal translation became seriously ill and it was not possible to find a regular substitute so quickly, so that was not a problem for me. In the early 1980s I then had a half-time position on a two-year contract; my employment contract with Michelin was reduced to 60% during this period – otherwise I would never have managed such a full schedule. I was teaching German/French legal translation and French commercial correspondence to 3rd and 4th semester students on the one hand, and on the other I was in charge of the tutorials in German/French technical translation for those students taking their comprehensive examinations. I also supervised a number of diploma theses. I greatly enjoyed working with the students. Unfortunately there are hardly any permanent positions at German universities. Teaching people, awakening their enthusiasm for a subject, accompanying them through a part of their professional development – that’s very fulfilling. 3. You have been working for Michelin for nearly 30 years! You began as a French and German teacher for managers, but then had the chance of implementing a translation department there. How cool is that? You programmed CBTs (computer-based training courses) for factory workers, organized professional development courses for managers, installed an intranet for Michelin Germany, Switzerland and Austria, and implemented an Internal Communications department in those three countries as well. I clearly see why Nicole nominated you! How does this impressive professional experience help you nowadays as a freelance translator? I had the privilege of pursuing an unusual path at Michelin. I gained incredibly valuable experience from the implementation of the projects you mentioned as examples, and I still reap the benefits from that on a daily basis. When you manage a project and you’re responsible for a budget of six figures or more, and you have to procure external services and manage and monitor the implementation in multiple plants, you learn what doing business with an entrepreneurial approach really means. Nobody can ever take that away from you. I should add that Michelin is a very special company, in which people are given numerous opportunities regardless of where they come from, their gender, their disabilities, etc. I had the great good luck and the honor to accompany the executive directors at that time on numerous business trips in Germany and to interpret for them: François Michelin and his son Edouard, two unique and impressive human beings. And yet I took the risk of going into business for myself, because I wanted to put myself to the test once more. 4. Giselle, you have your “Rüsterweg” blog, the knowledge database “Wissenswinkel” and the “Tips for Translators” on your website; recently you also began your newsletter “Café Umlaut”. Honestly, that’s an amazing amount of work. What motivates you? As I just explained, I had the good fortune to learn a lot and gather valuable experience over the course of my career. I’d like to share all this experience with those who are interested, or, to return to the example of the pot of soup, I simply want to put a few good pieces of meat into the broth so that others benefit from it as well. It all started with the section “Die Welt des Übersetzens” (“The World of Translation”) on my “Rüsterweg” blog. At some point I wrote about a subject specifically for translators – that was the article “Langatmig, aber zielführend” (“Tedious, but Productive”), about customer acquisition, and suddenly I had loads of subscribers. My post entitled “Honorarfreie Übersetzung” (“Pro Bono Translation”) – an article that was translated into English, Italian, Spanish and Russian and which I translated into French – is surely the most popular of my blog posts with 1,660 “likes”. In spring 2015, I launched the “Wissenswinkel” website – a knowledge database for young language professionals – together with my colleague Sabine Lammersdorf. And then in July 2015 I began writing my “Newsletter”. None of this is aimed at customers – it is neither sales-oriented nor is it financed by advertising or similar means. Since you asked about the time involved – yes, of course it is a lot of work, but it’s worth it, because in the meantime so many interesting contacts to younger and older colleagues in the translation industry have developed that I really enjoy it. 5. You don’t use CAT tools and never have – why not? Don’t you think it could help you be more productive? Well, many of my texts are simply not suitable for them, and in many cases my translations are adaptations. Quite honestly, I can’t say much about CAT tools. I hear about “segments” and imagine that in the end, the work of the translator consists of inserting the missing pieces of the puzzle – that’s not my style at all. My translation memory is my brain, and yes, a few glossaries I put together myself. I’m an avid user of the voice recognition program “Dragon Naturally Speaking” and with that I am extremely productive. In my specialist fields such as tire technology, financial reporting, plastics technology, etc., I rarely have to do any research any more – I can simply start dictating and wander around my office while doing so – yet it’s not at all boring. Besides, translation is only one of my sources of income. I also work as a freelance author for several companies, e.g. for corporate blogs, customer and online magazines, and so on, and for many years I’ve done intensive writing coaching for top-level managers. I’m currently expanding the two latter activities and reducing my translation work slightly. And I’ll let you and your readers in on a secret: I’m also working on two of my own books. I can’t tell you anything more about that at present. 6. You are an advocate of high(er) rates, premium markets and the like. Could you tell us a bit more about those topics? Well, I’m firmly convinced that there’s a place for everyone in the global translation market: the big full-service agencies for the so-called bulk market, the smaller SME service providers that operate in defined market segments and/or have their regular customers in niche markets, and of course for the individual translators who provide their services in their (premium) market, in their own particular playground, so to speak. The market has all those elements, no question about it – just like there are premium tires and low-budget tires. And here we’re not debating what’s “better” or “not as good” or “worse”. As a customer, I have to decide what I want, no matter what the product is: a 13-cent roll from a discounter or bread from a baker who still grinds his whole-grain flour himself; a low-priced tire, because I only drive my small car to town, or a premium tire for a powerful car and long drives on the autobahn; an 11-euro haircut by a hairdresser who doesn’t give appointments, where I have to blow-dry my hair myself; and last but not least the translation of an internal working document or of the financial report that’s sent to shareholders, the customer magazine that’s really an adaptation rather than a translation, and so on. What makes the difference (and I am speaking here exclusively for “non-literary” translators, as I have no experience with literature translations), is, in addition to the talent required for this profession, outstanding qualifications in the relevant field and above all specialization, which however becomes increasingly differentiated and narrowly focused. I don’t work for agencies, but once in a while agencies contact me because they can’t find anyone for certain niche specialties in my language combination (French/German or German/French – I don’t work in any other languages). Then they are willing to pay nearly my direct-customer price. Of course, the so-called soft skills are just as important. I conducted a small, non-representative survey on this subject in summer, and described the results over the past few weeks in a three-part blog post on “Rüsterweg” (in German). The major German professional associations and even the FIT shared the article in the social media. This series has now been reprinted by the magazine of the German professional association ADÜ Nord. In general, the following can be said of the market: there are more and more translators willing to work for very low prices. I’m not talking about countries or continents where the prices are low due to the low cost of living. The agencies are under pressure and competing with platforms via which even students are offering their translation services for little money. On the one hand, I believe our colleagues have an obligation to persuade customers to accept reasonable prices using appropriate arguments. That is possible – I am speaking from experience. But there are many agencies as well that need to educate their customers about the complex process of translation. If all of the discounters in Germany priced their rolls at € 0.26, i.e. double the present price, they would still be cheaper than the rolls of “real” bakers, but the producer and his employees, suppliers, etc. would be happy. The key word here is fair working conditions. I always ask myself how it affects us when we see a T-shirt for € 2.99 in a shop. Doesn’t anyone think about that? 7. On this same topic, it seems that your opinions, even though they are similar to Kevin Hendzel’s and Chris Durban’s, for example, are sometimes criticized quite harshly by some people. Do you think people are more influenced by what “famous” translators say as compared to what we, for example, say? If so, why do you think that happens? It’s not my ambition to become “famous”. And by the way, I don’t count myself among the “greatest women in translation”. Over the course of my career, I’ve been an employee, as a department manager in an executive position as well; I’ve also been an employer and I am an entrepreneur – in my heart I always have been, even when I was working at Michelin. Against the background of this comprehensive experience, I’d like to highlight a few subjects and problem areas, make people aware of options for optimization and provide a bit of support to young colleagues. Some of our colleagues forget that before you can optimize anything, you have to determine where progress can be made and how shortcomings can be rectified. Why do people attack me, even though I don’t do anything differently than Kevin and Chris? Several highly esteemed colleagues have asked me that recently. It’s certainly easier to throw punches at someone who’s within arm’s reach. 😉 I’m “close” to my colleagues, I’m accessible, and therefore attackable. Those who take a public stance have to expect that. I can live with it – my motto is “Strength lies within serenity”. In the end, my professional success shows that my strategy and my way of doing things can’t be wrong – which of course doesn’t mean that it’s the only way. Lots of different roads will take you where you want to go. Criticism is important when it’s constructive. Discussions that bring together very different opinions and experiences are extremely interesting when they are conducted in a factual, objective manner. But there’s the rub: critical reactions are not always factual or objective – apparently some people (only a few – I’d like to emphasize that) think that in the virtual world of social media they can just chuck all of the basic principles of respectful interaction with one another out the window. That’s not my style. But to be honest, I receive so much nice feedback, colleagues call me up and ask for advice or tell me about their success in implementing one of my suggestions, ask interesting questions… it’s wonderful! Whenever my work gives colleagues food for thought and helps them professionally, I’m happy. And that’s all that counts. 8. During the time you worked at Michelin, you also worked as a freelance translator and consultant in your spare time (in the evening, on holidays, weekends, etc.). What advice would you give someone who has a full-time job, but wants to become a freelancer? How can they make the most of their spare time to start their freelance work? When I started working at Michelin as a German and French teacher for managers at the end of the 1980s, I didn’t earn very much, so I went looking for a second job. I taught at language schools and translated. And yes, I worked very long hours, but I must admit I’m a workaholic. To me, the word “work” does not mean an oppressive burden or stress, but rather passion and joy. I’ve no idea where this mindset came from. During all the years at Michelin, I held other jobs on the side, and thus built up a solid customer base, pursued my specialty fields in-depth, talked to experts, developed a network, long before the term “networking” in its current form became a buzzword. You mustn’t forget that when I started out, there were no computers, no Internet, no e-mail, no mobile phones. Of course I had leisure time, weekends and vacations, but probably not to the extent of most of my colleagues. I don’t regret that at all – on the contrary. Thanks to all that hard work (and solely that hard work) I am now in a position in which I can lean back, to help my colleagues with tips and suggestions, to reduce my customer base (which consists only of direct customers), and to focus on personal projects like a planned foundation and my books, and I don’t have to worry about what comes after my active professional career. You asked what I would recommend to our colleagues. I’d like to start by saying that there are simply too many people who become freelancers immediately after completing their studies or give up a salaried position without having any financial reserves. They then accept practically “every” job, even at low prices, work under great pressure and end up in a vicious circle because they don’t have the time to acquire better-paying customers. That’s not a good situation for anyone. I think it’s better when you prepare your entry into the world of self-employment from a secure position, i.e. from a salaried position. That doesn’t have to be in translation. 9. Now it’s your turn. Who, in your opinion, is one of the Greatest Women in Translation? I could name several colleagues who do great work and successfully reconcile their family and professional lives. They have my full respect. I’d like to nominate our dear colleague Sabine Lammersdorf as one of the Greatest Women in Translation. She raised a son, developed her customer base, specialized in her fields and is pursuing a university degree “on the side” as well. Chapeau! Sabine and I share not only the love of our wonderful profession and our mindset in that regard, but a friendship as well and a pet project – the knowledge database “Wissenswinkel”. I could not possibly imagine a better partner for this project! Now I feel a bit like I’m at the Oscars, but I’d like to thank you, dear Caroline, very warmly, for giving us Women in Translation a forum here, and Nicole Y. Adams for nominating me. I hold her work in high esteem. Thanks also go to my colleague Monique Simmer for putting my Franco-German thoughts into English. Without a doubt, she is also one of the “Greatest Women in Translation”, a genuine professional. Thank you, Giselle, for kindly accepting Nicole’s nomination and my invitation to answer my questions for our interview! It was a pleasure connecting and getting to know you better. Monique Simmer deserves a medal for translating your thoughts, especially as your responses were so wonderfully detailed and long, Giselle! I have to say that having read your words and thoughts in French and German, Monique seems to have captured your character in this interview. That is no mean feat! I have to agree with you. I was reading the interview and thinking how perfectly it was translated. Thank you so much for your kind words. Yes, Monique did an amazing and wonderful job. As I said, she is a genuine professional. Thank you also for considering my interview as fascinating. I think that we all have something interesting to share. Sie haben ein sehr schönes, sprachlich warmes, wertschätzendes und inhaltlich für mich informatives und einladendes Interview gestaltet. Ich mag diesen kreativen Stil und freue mich, hier noch einmal Persönliches aus der Welt der Übersetzer oder der EINEN Übersetzerin zu lernen. Ihr Business ist mir relativ fern, doch die Welt der Free Lance Consultants – no matter the trade – ist mir wiederum vertraut. Ganz offensichtlich teilen beide Welten gemeinsame Werte, was ich sehr schön finde. Viel Erfolg Ihnen allen. Ihr hoher Anspruch ist ansprechend und soll sich lohnen. Thank you, dear Mrs. Schulte, for your warm words. My young colleague Caroline in Brazil is the one who deserves gratitude and respect for launching this series.